Our quick trip down the inner coastline was easy and gave us a chance to get our sea legs back and get our sailing skills back. The boat maintentance was a little more than we had anticipated. The Japanese paint we used last year didn’t adhere very well to the old Trinidad paint so we did a quick and dirty wash and sand, recoat of the waterline and other flaking areas. The propellor was scraped of barnacles, zincs changed and polished. We’re back in the water ready for a departure northbound to Kushiro, Hokkaido. 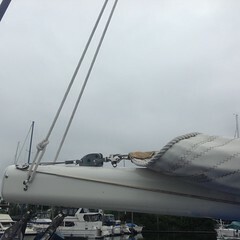 We finished the painting in 20 kts of wind, completed the cleanup process just as the rain started to pound onto the ramp. Big mess to clean up the interior and restow all the tools and gear. We are heavily loaded with over two years of South Pacific souvenirs, Japanese food, clothing and dishes. Our waterline – thats the light blue stripe in the picture – is suppose to sit well above the water. Ahem, according to John – I have too much stuff on board. The fueling is so easy here, they pull up next to the travel lift and they complete the fueling. All fine except of the cost of fuel is about $5.00/gal. We are ready when the weather turns in the next couple of days. John has been wonerful as I cry when I say another goodbye to family and friends. Its so difficult to leave but we are focused on our passage. Stay with us as we head out! It was a quick 2 night, uneventful passage from Fakarava to Papeete, Tahiti on May 28th. We had a lucky motor/sail as the wind never picked up enough to sail the entire distance but we outran the SPCZ as it moved south. It has been a productive week in the Papeete Marina with wifi, shopping, shower facilities all so close, stepping off the boat onto the dock has been wonderful – no salty dinghy ride to shore. We were able to FaceTime with Mom, my sister and sons, that was a treat I didn’t anticipate. We had some boat projects to work on – lost a dinghy oar in rolly conditions back in Nuku Hiva – a French boat gave us an old one he had, traded for some chocolate bars – nice guy; the dinghy motor fell apart while in Fakarava – purchased a new one in Tahiti and cheaper than US for Japanese manufactured Tohatsu 2 stroke that is unavailable in the US; 2 solar panels went dead – no replacement available, new laptop broke just as we left Nuku Hiva – needs to be shipped back to the US, the Bluetooth keyboard for the IPad broke- too expensive to buy a new one, ordered a new raw water pump for engine – have a small but irritating leak. We’re in the process of ordering all these replacement parts to be sent to American Samoa where there are no customs taxes for parts and can be shipped via US Express mail service. A huge dent to the cruising budget but it’s the cost of living just like home and driving a used car, something needs to be repaired or replaced. 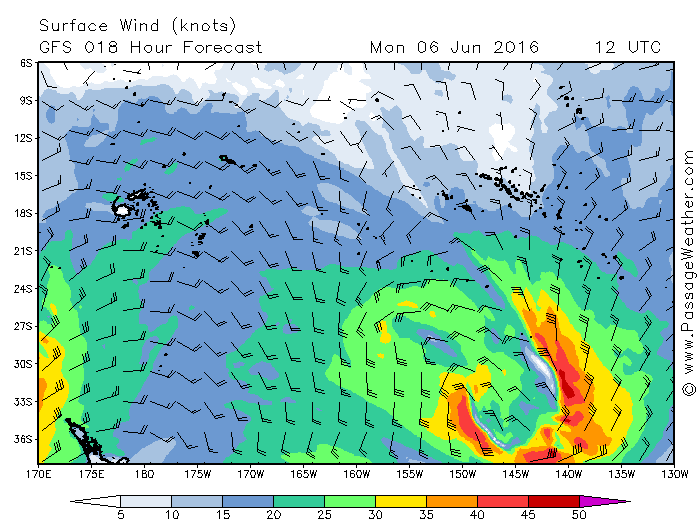 We had planned to sail to Moorea today but the weather system south of us turned into a gale. The winds are suppose to pick up to 25 kts with 4 meter waves on Wednesday/Thursday moving NE. Just above the multi-colored hook shape are the Society Islands where we are. 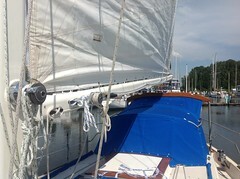 We’ve done that wild sail before, hell no we’re not sailing it if we don’t have to. Honestly – not a lot of fun! And its just about the time we were planning on snorkeling the reefs and paddle boarding around Cook’s Bay. This weather system is suppose to move off by NEXT Monday. The wind was blowing out of the northwest today sending waves right into the Marina, white caps were in the harbor. By tomorrow the wind should subside enough so that we can motor around the island into Taina anchorage until the gale bows off. 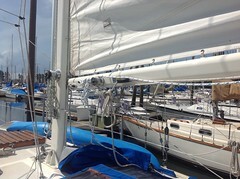 Marina life is great for a few days, after that, sensory overload. The cars, people, noise and shops become overwhelming. Aside from the convenient Marina life in Tahiti, we’ve had a great time people watching, touring the island via car. 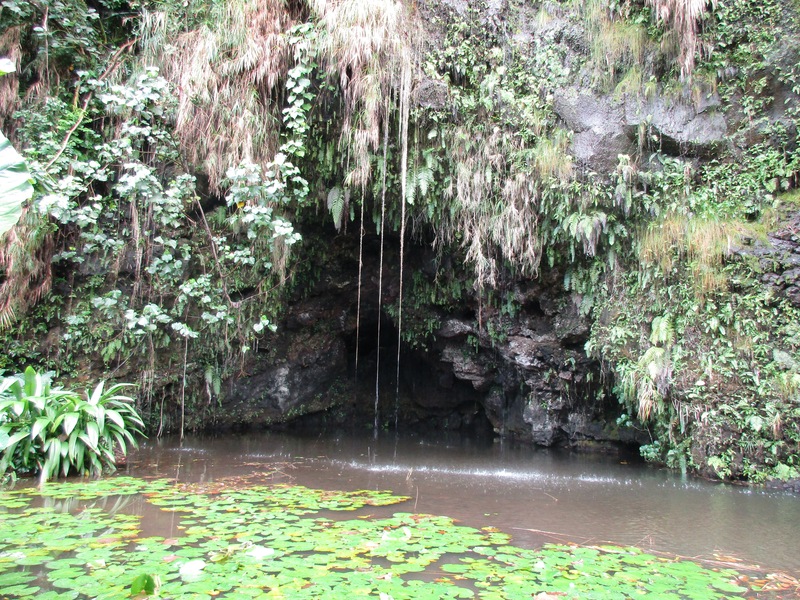 This is a grotto, one of many along the west coast of Tahiti. Beautiful scenery and coastline. Shopping, buying beautiful Tahitian print fabrics, eating very expensive ordinary meals – $63 for a small plate of pesto spagetti, 10′ pizza, and 2 beers. Wifi with speed just a little above the old dial up is spotty and frustrating but better than no wifi on the ocean. 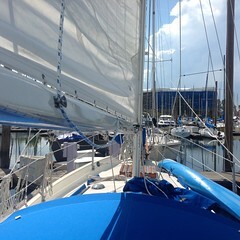 We’ve said our goodbyes to buddy boats Sababa and Athanor, each boat heading their own direction. Our newest friends on SV Chevalde whom we met in Hiva Oa, Marquesas happened to be walking along the malecon and spotted our boat. We had a happy reunion with them. 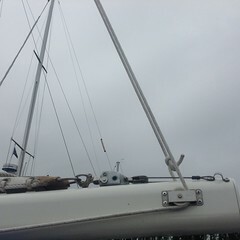 They are anchored in the Taina anchorage where we’re going tomorrow, maybe we’ll sail together until our visa expires. Never know who you meet along the way but it always turns out to be a strong bond between cruisers. Waiting and watching the weather forecast everyday to depart Tahiti. We are ready for our next adventure!